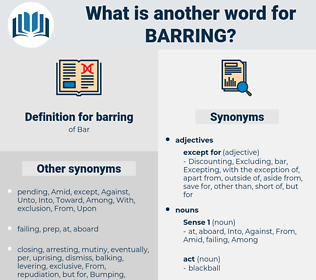 What is another word for barring? banning, Prohibiting, discouraging, Proscribing, forbidding, Restraining, Precluding, Preventing, Obstructing, restricting, Excluding, excludes, Eliminating, Removing, approving, constraining, prevention, Disallowing, absent, Interdicting, Discontinuing, thwarting, Repealing, Suppressing, withdrawing, curbing, impeding, stopping, averting, Abolishing, Depriving, confirming, Ratifying, inhibiting, Excepting, blocking, Outlawing, Hampering, extinguishing, hindering, arresting, undermining, Cancelling, Refusing, Deterring, Exempting, withholding, concealing, Endorsing, Deleting, distance, Distancing, imposing, enjoining, Waiving, less, Denying, failing, lacking, halting, dropping, hiding, Omitting, Lifting, facing, Begging, Stemming. compliance, support, encouragement, submission, obedience, allowance, approval, toleration, authorization, clearance, license, endorsement, promotion, permission, sanction, sufferance. Barring this trifling misunderstanding, they were in perfect accord. Again the Colonel stood in front, barring the way. behrens, bearing, brown onion sauce, bearnaise, branchy, brunswick, bring, branch, behring, brown ash, bar mask, bronze age, brancusi, brumous, burning, brininess, brown oak, burmese, brownish, barrenness, borrowing, brunch, bronzy, bronc, bronx, Brawniness, baronage, brainwash, Bering Sea, bromus, burnoose, burying, burnish, broncho, burns, bromic, brimming, brownness, bronze, braincase, burnous, bareness, branchia, brink, beer mug, bronchus, brown sauce, brown-nose, braunschweig, brewing, baring, brainsick, brainiac, barong, burmese-yi, brainish, bering, baroness, burmanniaceae, brahminic, bronco, browning, boronic, burhinus, burrawong, brownie mix, burnouse, boring, brahms, Brown Swiss, biramous.